Dr. Mathew K Joseph completed his MS in ENT and DNB from Kasturba Medical College (KMC), Manipal in 1993 & FRCS in ENT in Royal College of surgeons in Ireland. He worked as assistant professor in ENT department of KMC Hospital, Manipal. Dr. Mathew K Joseph specializes in Endoscopic Sinus Surgeries and other ENT Procedures. He has presented several research papers at national conferences. Dr Mathew likes to remain updated with the latest medical techniques and regularly attends conference, seminars and workshops. 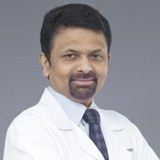 Dr. Mathew K Joseph has an excellent and impressive track record of over 21 years in the ENT Surgical field. He is presently is working in NMC Hospital Deira since 1988 in the ENT Department. Dr. Mathew is well versed in English, Hindi and Malayalam.